Worldwide, solar energy technology is growing day by day, becoming both cheaper and more efficient. With record-setting solar farms, it is the cheapest source of energy in many countries. When we think of solar panels, a picture of bulky units of solar panels installed on rooftops comes to mind. However, with this mind-blowing invention by researchers from Michigan State University things are going to change. 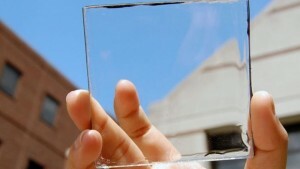 Scientists have developed transparent solar cells that will capture only ultraviolet and near-infrared light. These panels are transparent, which means that they can be used just like normal windows in cars or homes, but they will also convert light falling on them into energy. Researchers boast that the cells could deliver up to 40 percent of electric power in the United States.